2008年、広島原爆ドーム上空に飛行機雲で「ピカッ」と描いた作品「ヒロシマの空をピカッとさせる」の製作が社会的騒動に発展し、企画されていた広島市現代美術館での個展は中止となった。ChimPomはその騒動をまとめた検証本を出版し、さらにその後もヒロシマと核問題をテーマに多くの作品を制作。 それらをまとめた展覧会を、「広島！」(2009年、Vacant 、東京)を皮切りに、「！」をひとつづつ増やしながら巡回させている。 2013年には、ギャラリーGの呼びかけと広島市民たちの協力により、自身最大規模の個展として、広島での開催（「広島‼‼‼」展、旧日本銀行広島支店）に至っている。 In 2008, ChimPom made a skywriting of the word "PIKA!" in the sky above the A-Bomb Dome in Hiroshima for "Making the Sky of Hiroshima 'PIKA!'" 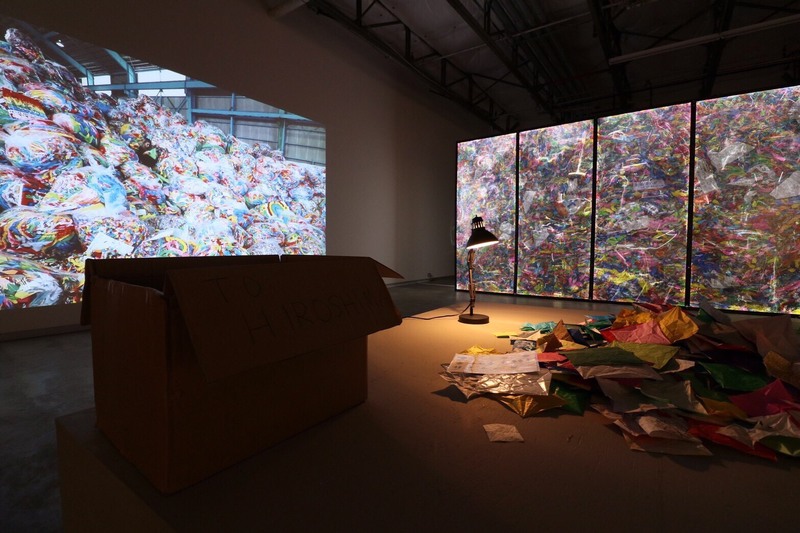 project, which developed into a dispute and brought about cancellation of a solo exhibition to be held at Hiroshima City Museum of Contemporary Art. Having published a book reporting and investigating the dispute, ChimPom has continued to produce many works on Hiroshima and nuclear issues. With "HIROSHIMA! "(2009 Vacant, Tokyo) as a start, the summerized exhibition "HIROSHIMA!" has traveled around with those works, counting up with adding an "!" in the end each time. 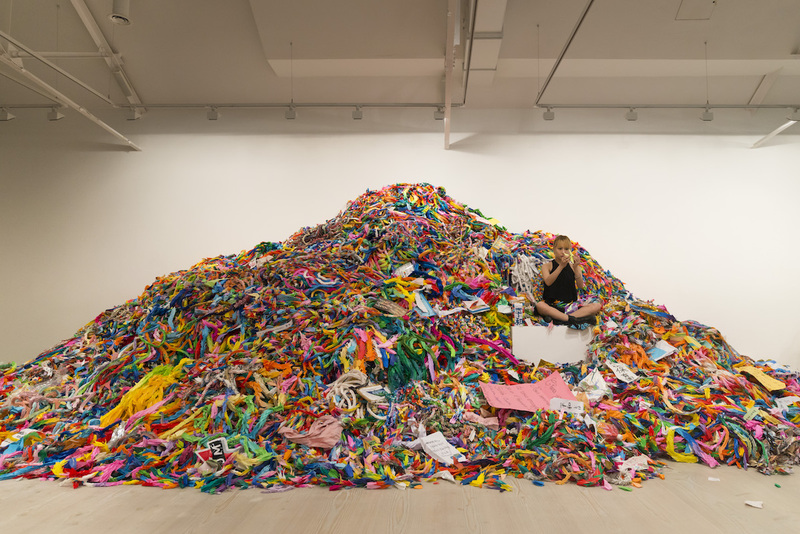 In 2013, it was brought to Hiroshima as Chim↑Pom's biggest solo exhibition ("Hiroshima!!!!!! ", The former Bank of Japan Hiroshima Branch) by Gallery G's calling out and support from some citizens of Hiroshima. 2012 On October 21st 2008, Chim↑Pom was preparing 'Making the Sky of Hiroshima “PIKA!”' for a solo-show to be held at the museum studio of Hiroshima City Museum of Contemporary Art. 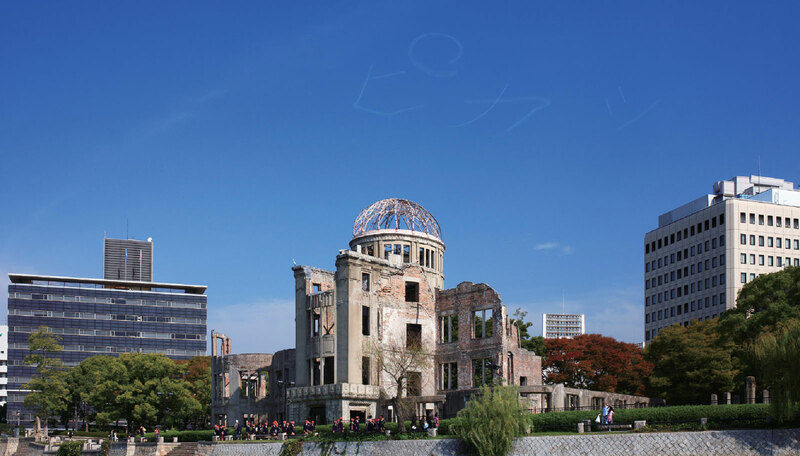 Having chartered a skywriting plane, they had planned to write the word “PIKA!” with a vapor trail in the sky above the A-bomb dome and make a photo and video documentary of the event. 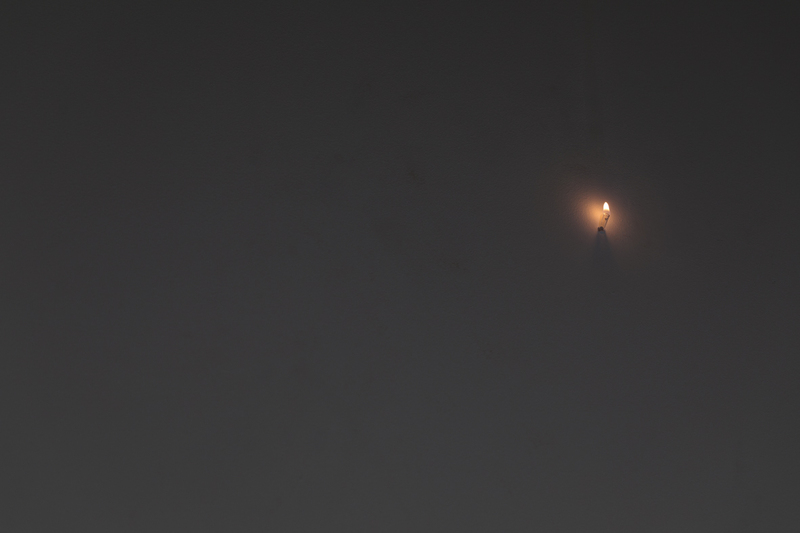 However on the following day, the "Chugoku Shimbun" newspaper published an article strongly condemning the act, along with a photo taken by a citizen who witnessed it. In response to the voices of outraged citizens and A-Bomb victim organization representatives saying the act was “unpleasant,” the article claimed that “PIKA!” reminds people of “PIKA DON,” and thus, was a very shortsighted artistic decision by the group. 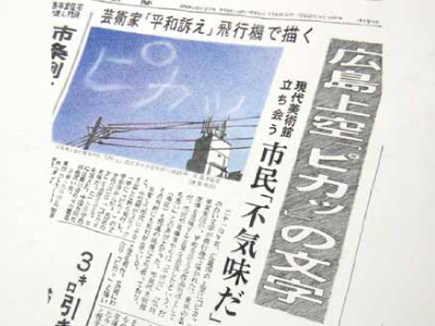 This news was soon reported on by a number of other online and print media outlets, growing into such a controversial social issue that Chim↑Pom eventually came to make a public apology for their “lack of advance announcement” in front of A-Bomb victim organization representatives. 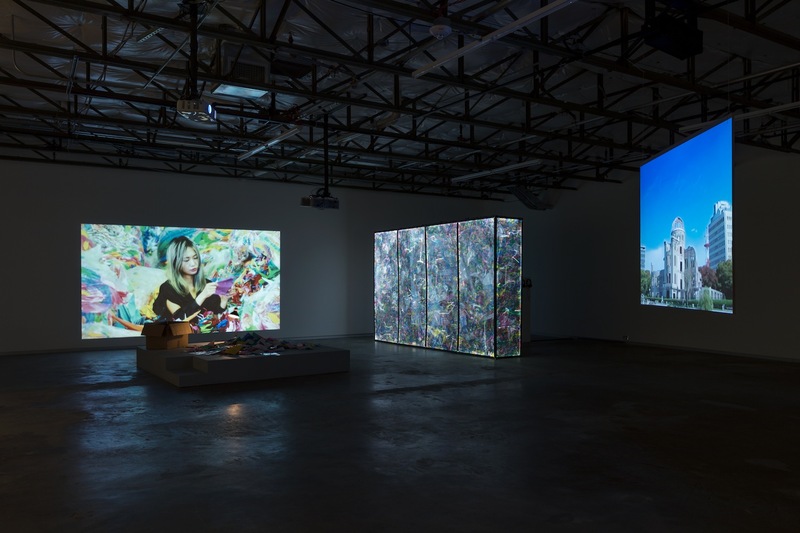 The planned solo show had to be canceled as “voluntarily refrained.” At that time, Chim↑Pom lost the opportunity to show it as their latest work to the public. 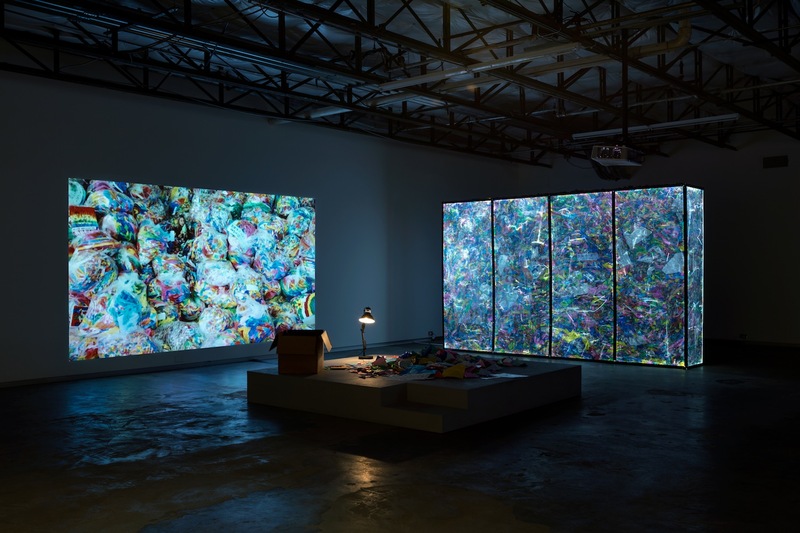 On the other hand, Cai Guo-Qiang's "Black Fireworks : Project for Hiroshima" conducted on October 25th, which set off 1200 black fireworks near the A-Bomb dome, won the highest praise from media outlets. 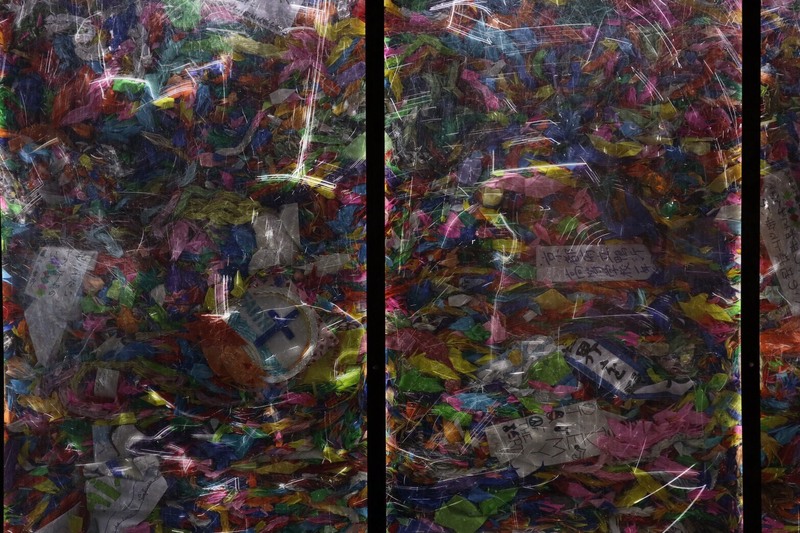 This work was a part of the anniversary exhibition of the Hiroshima Art Prize hosted in the same Hiroshima City Museum of Contemporary Art. Later, Chim↑Pom united with those A-Bomb victim organizations and began preparing 'Why Can't We Make the Sky of Hiroshima “PIKA!”', a book investigating the series of disputes through interviews with the organizations and contributions from critics, artists, and the like, which was then published in the following year, March 2009. Much more than an ordinary art book, it also examines the contrast between the United States and Japan on their positive and negative understanding of the A-Bomb, between the victors who brought WWII to an end and the defeated who experienced the A-Bomb's effects, and political aspects of Hiroshima behind its international appeal as the A-Bomb site. 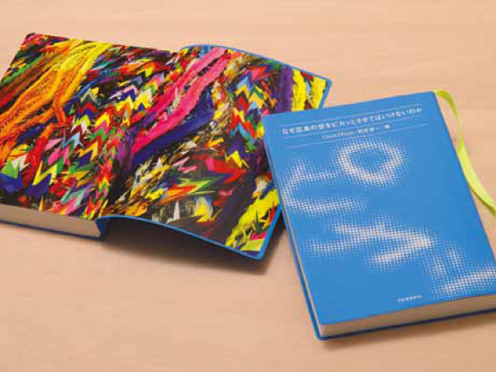 The book also suggests differences, perhaps due to a gap in generations, between Chim↑pom and many other artists who deal with the A-Bomb as a motif, such as Yukinori Yanagi or Takashi Murakami for instance. 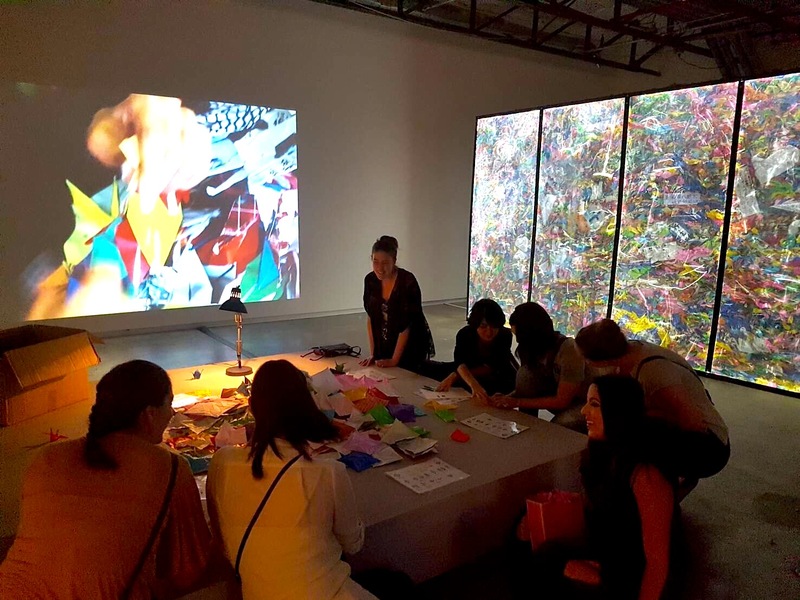 incidentally, the work 'Making the Sky of Hiroshima “PIKA!”' was eventually displayed at Maruki Gallery For The Hiroshima Panels (Saitama), a museum dedicated to housing $$The Hiroshima Panels,$$ the most famous anti-war A-Bomb art by the couple Iri & Toshi Maruki. *Note: “PIKA DON” is a mimetic word created by A-Bomb survivors, who had not known even the word “atomic bomb” at the time, expressing what they experienced in the explosion with “PIKA” as the flash and “DON” as the roaring blast that followed. Later, the sound “PIKA” alone came to be established as a word for the A-Bomb. Countless numbers of origami cranes are sent to Hiroshima City from all over the world. This ritual originated from the true story of a Japanese girl Sadako Sasaki who was diagnosed with leukemia after being exposed to radiation from the atomic bombing of Hiroshima in 1945. Sadako kept folding origami cranes wishing for health and peace, based on the legend that a wish comes true when one thousand of paper cranes are folded. Ever since, Hiroshima’s Peace Park and the Children's Peace Monument receive vast amount of origami cranes that express an intimate wish for world’s peace. The city of Hiroshima, however, has been facing a practical problem of preserving ever-increasing amounts of cranes. In the warehouse where the plastic bags with cranes are stored, they are categorized and labeled as “non-burnable trash” due to the prayers and emotional messages of people who sent them.This sight reminded Chim↑Pom of the immense land around the Fukushima nuclear exclusion zone now covered in mountains of black garbage bags filled with nuclear waste ever since the explosion in 2011. With no existing disposal plan, the waste remains. This visual spectacle appears as the outcome of Japan’s history of nuclear disasters that continues from Hiroshima to Fukushima. 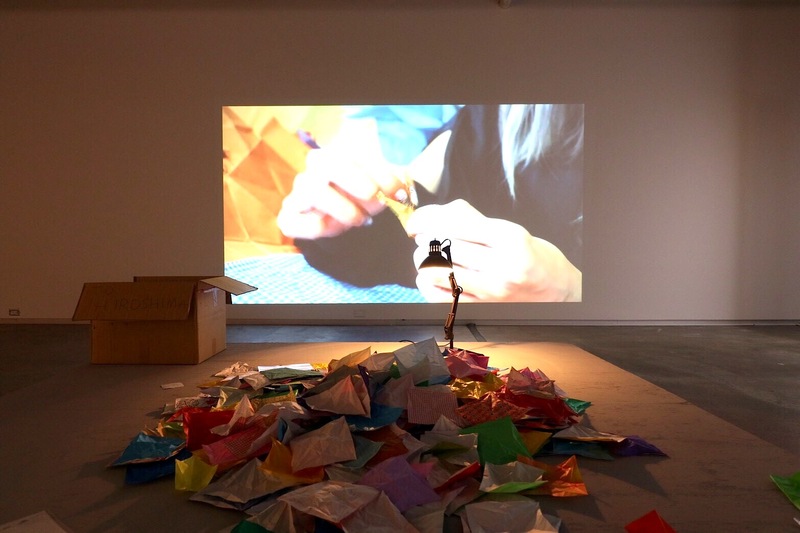 Shipped from Hiroshima warehouse, the origami cranes were unfolded by Chim↑Pom in Dallas. 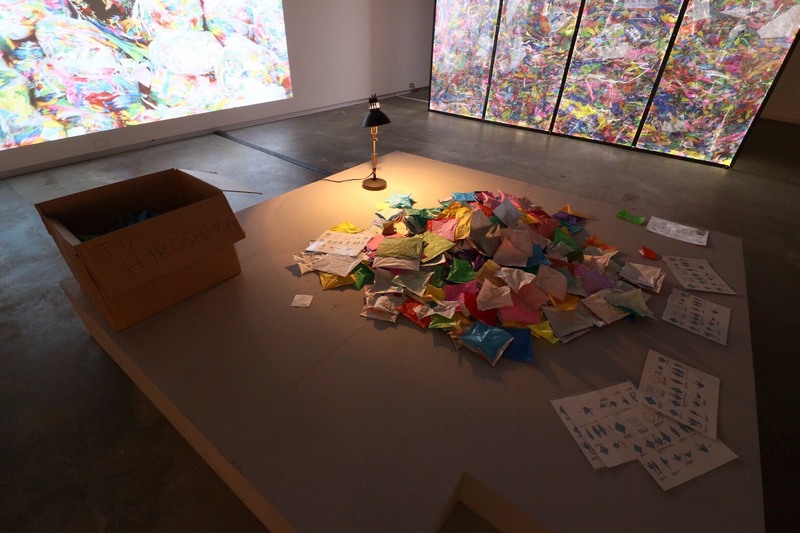 The artists invite audience to participate in the act of refolding paper cranes and sending them back to Hiroshima thus continuing the cycle of this “non-burnable” material. 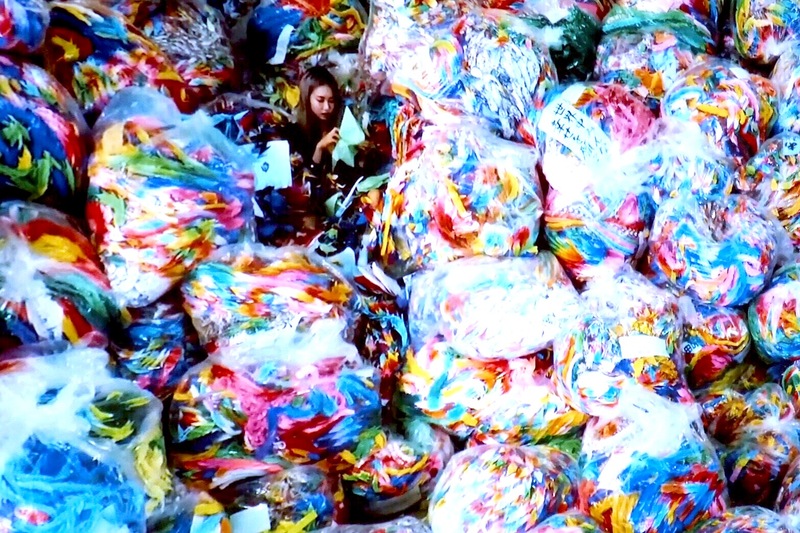 Countless numbers of origami cranes are sent to Hiroshima City from all over the world. This ritual originated from the true story of a Japanese girl Sadako Sasaki who was diagnosed with leukemia after being exposed to radiation from the atomic bombing of Hiroshima in 1945. Sadako kept folding origami cranes wishing for health and peace, based on the legend that a wish comes true when one thousand of paper cranes are folded. 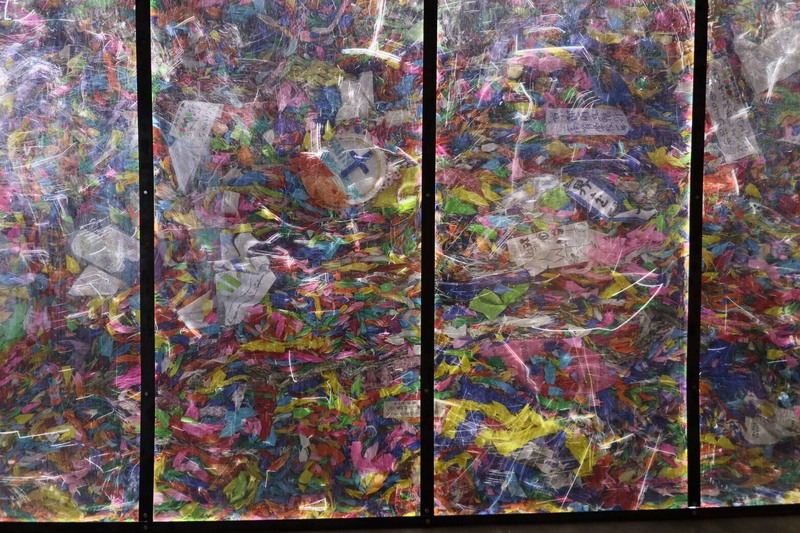 Ever since, Hiroshima’s Peace Park and the Children's Peace Monument receive vast amount of origami cranes that express an intimate wish for world’s peace. The city of Hiroshima, however, has been facing a practical problem of preserving ever-increasing amounts of cranes. In the warehouse where the plastic bags with cranes are stored, they are categorized and labeled as “non-burnable trash” due to the prayers and emotional messages of people who sent them.This sight reminded Chim↑Pom of the immense land around the Fukushima nuclear exclusion zone now covered in mountains of black garbage bags filled with nuclear waste ever since the explosion in 2011. With no existing disposal plan, the waste remains. This visual spectacle appears as the outcome of Japan’s history of nuclear disasters that continues from Hiroshima to Fukushima. 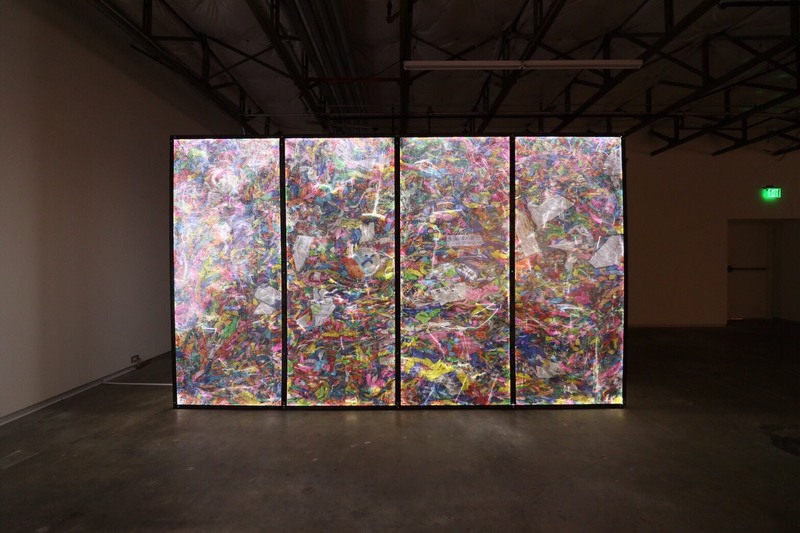 Shipped from Hiroshima warehouse, the origami cranes were unfolded by Chim↑Pom in Dallas. 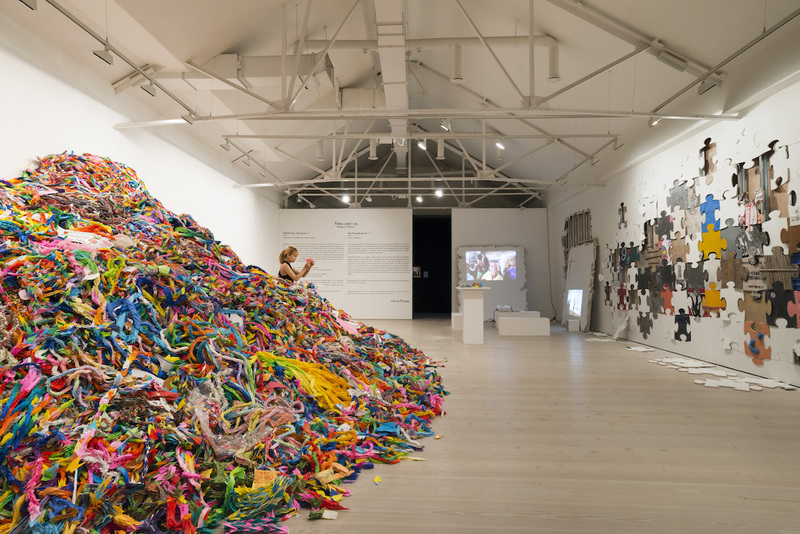 The artists invite audience to participate in the act of refolding paper cranes and sending them back to Hiroshima thus continuing the cycle of this “non-burnable” material. 素材提供：　広島市 Countless number of origami cranes are sent to Hiroshima City from all over the world. This is originated from the true story of a Japanese girl who was diagnosed with leukaemia after being exposed to radiation from the bombing of Hiroshima and kept folding origami cranes wishing for health and peace, based on the legend that a wish comes true when the number of a crane reaches to one thousand. Ever since, Hiroshima receives vast amount of one thousand origami cranes and it has become as if a world collection of prayers each expressing an intimate wish for world peace. Hiroshima, however, has been facing a practical problem to preserve ever-increasing amounts of cranes. 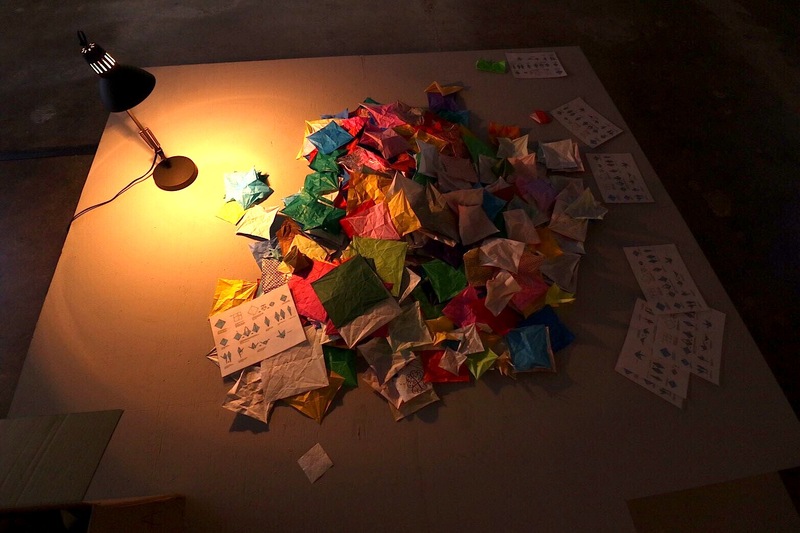 Each origami crane holds peace in its meaning, Chim↑Pom on the contrary, unfolding each wish. The reaction appears counteracting each other, but the endless loop of destruction and peace should be beyond an act of prayer and the endless loop is inevitably everlasting challenge. 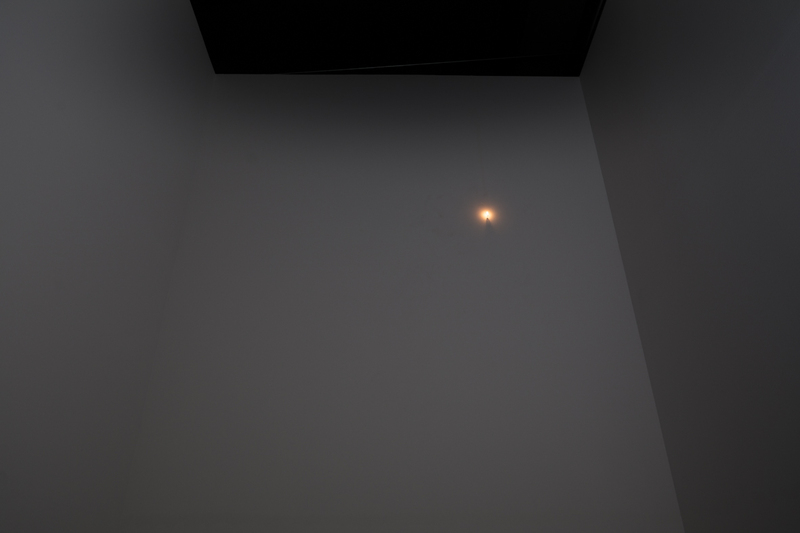 Performance will be shown for two hours daily, sometime during the exhibition. 一連の騒動を検証した本。たくさんの美術家、美術評論家、広島問題の評論家たちによる論考のほか、被爆者団体とChim↑Pomの対談なども収められている。 investigates not the work Making the Sky of Hiroshima “PIKA!” itself, but themes of “A-bomb/war,” “contemporary society,” and “expression” through various “PIKA!” disputes, as it was published prior to the public exhibition of the work. 広島・原爆ドームの上空に、飛行機雲で「ピカッ」という文字を描いた作品。広島の風景 に漫画の1コマのような擬態語を描き、ゆっく りと消えていく様子に記憶の風化を重ねることで、戦後日本の平和に対する現代的な歴史観を映し出した。 Writing the word “PIKA!” in a vapor trail in the sky above the Atomic Bomb Dome in Hiroshima, this work put a mimetic word in the scenery of Hiroshima reminiscent of a panel from a comic book, layering the disappearing vapor trail on the decay of memories, as an expression of contemporary historical understanding of peace in postwar Japan. 実物大のリアルな鶴のフィギュアを、個人や団体から1羽ずつ受注製作し、いつの日か1000羽になることを目指しているプロジェクト。広島には世界中から膨大な数の折り鶴が届けられるが、それは一律なデザインで折られながらも、平和へのそれぞれの想いが込められた、いわば「人類の祈りの集積」といえるだろう。また、このプロジェクトでは、鶴が1羽増えるたびに、発注者の祈りのプレートも1枚ずつ追加されていく。アートを収集することと人類の祈りとが、「千羽鶴」の名の下で接続される。 This project aims at producing 1000 life-size realistic crane (gures one by one as a commissioned work from individuals and organizations. Hiroshima receives a number of origami cranes from all over the world, and this can be seen as “a collection of human prayers” all made in the identical design each expressing an intimate wish for peace. Ever time someone orders a crane, this project also produces a plate engraved with his/her prayer. 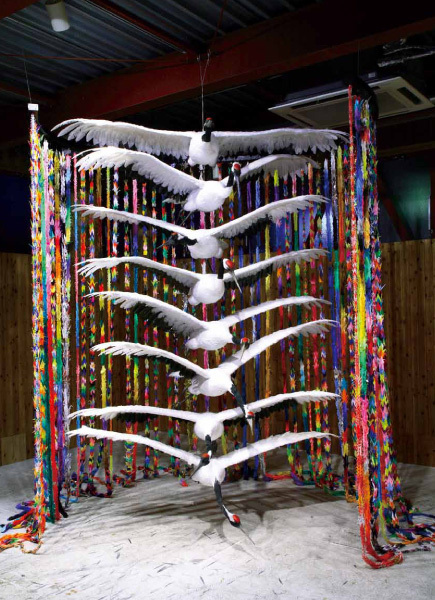 Art collection and human prayer are connected together under the name of “Senbazuru” [a thousand cranes, a symbol of prayers for recover in Japan]. リアル千羽鶴Real Thousand Cranes 2008 FRP、羽、折り紙、祈りのプレート、ほか2008 FRP, feathers, origami, prayer plates, etc.